Ben and Jerry's Homemade Inc. term papers on A Model for Organizational Success. A common assignment on Leadership of Ben and Jerry's is to write a research paper on organization with a case study included. Paper Masters suggests that you compose a research paper based on the well-known case "Ben and Jerry's Homemade Inc., A Model for Organizational Success". 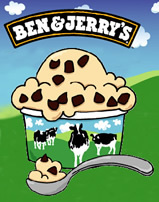 Ben and Jerry's Inc. is a business case study for business success. They are a values-led and mission driven company. The company gives back to society and an return on investment! Ben and Jerry’s operates under a distinct leadership style that promotes social awareness and enjoyment in the workplace. For example, the firm recruited a Chief Executive Officer by means of an essay contest. Furthermore, the firm is committed to providing its shareholders with a unique annual meeting experience, as demonstrated in the choice to hold the annual shareholders meeting at a live outdoor concert, whereby any shareholder could actively speak up and provide advice or opinions regarding the organization’s future. This unique leadership style emphasizes a model that is concerned with the company as well as its surrounding communities. Additionally, in recent years, the firm has been nationally listed as one of the top 50 best companies for minorities, one of the premier companies for working mothers, and conducts a non-discrimination policy that includes sexual orientation. It is under the leadership of its founders and executives that the firm has possessed a strong balance between social responsibility and natural tendencies for growth and profitability over the years, and although the firm is now a subsidiary of a larger entity, the founders are confident that their message and mission will prevail. One of the sources should be from the Ben and Jerry's website, which has plenty of information for research. Begin your project by pointing out that Ben and Jerry’s is a unique corporation that has successfully enjoyed periods of extreme growth and achievement with its premium ice cream products. Moreover, the organization possesses a distinctive philosophy regarding social and corporate responsibility that is extremely rare in today’s highly competitive markets. As a result, although the firm has undergone sweeping changes in leadership over the past several years, they are poised to continue their dominance in the premium ice cream market through their commitment to quality and the surrounding communities. Under the leadership of CEO Ben Cohen, Ben & Jerry’s became a leading company in the frozen confection industry, delivering a superior premium ice cream that challenged the industry’s giants. The company’s success was attributed not only to its production of a high-quality product, but also to Cohen’s unique, although unorthodox approach and social conscience. While Ben Cohen accomplished positive results for Ben & Jerry’s, things began to take a turn for the worse in the early 1990’s. After stiff competition caused the Company’s profits to fall and suffer its first loss in its history, Ben Cohen resigned as Chief Executive Officer in 1994. Robert Holland was hired shortly after. Cohen’s decision to resign was a wise one, however good things didn’t happen immediately. Holland’s management style differed from Cohen’s, however in the nineteen months he served as CEO, Ben & Jerry’s made significant expansions in both the international and domestic markets and increased the efficiency and effectiveness the company’s production and resources. Holland resigned in October of 1996 and Perry Odak became CEO. Odak increased the company’s profits but continued the trend, started by Holland, that was slowly changing the company’s social mission to one more corporate. Ben & Jerry’s statement of mission has included the production of a high-quality product, responsibility to shareholders and employees and maintaining a positive and productive role in society. The initial goal of the company’s mission statement was to institutionalize the idea of the company’s new corporate concept. It was also an idea that would make up the framework by which all decisions would be made and would insure that all facets of the company were moving in the same direction. Ben & Jerry’s has always claimed that their social mission has given them the competitive advantage and larger profits, but evidence has proven other wise, especially since the early 1990’s. The company’s stock hit an all time high of $ 32 in 1992. Since then it has averaged at $13 and has shown quarterly profit losses on many occasions. What is worse, shareholders have not seen attractive dividends in years. The company’s mission statement served a purpose for some time after is introduction, however it would appear that its impact on the company’s profitability has waned. Nothing speaks more clearly to this factor than the company’s recent acquisition by Unilever. Under the control of this industry giant, it has been forecast in both the public and private sectors that the company’s social conscience will be replaced with what may be akin to corporate arrogance. The importance of leadership is an essential concept in MBA and business management courses. Leadership Philosophy Research Papers examine an order placed for graduate level services on the leadership skills for a manager of a company. Management Versus Leadership Research Papers - They are, by virtue of the nature of the organizations they lead, distinct from leaders of armies and politicians. Application of Leadership Principles - A common assignment on Application of Leadership Principles for business administration often uses Steven Covey's book the 7 Habits of Highly Effective People. Leadership and Motivation Research Papers look at a preview of a paper order placed on a self improvement essay, and the specific requirements placed. Art of War Research Papers - The thing that intrigued me the most about The Art of War were the insights into leadership and business that Sun Tzu's philosophy provided. Leadership Development Research Papers preview a sample of an order placed for a Phd proposal. Analysis of Leadership research papers discuss a leader as depicted in The Road to Guilford Courthouse by John Buchanan. Literature Review for a Psychodynamic Leadership Approach as to why leaders are more effective when they have insight into their own psychological issues. Paper Masters writes custom research papers on Ben and Jerry's Homemade Inc. for A Model for Organizational Success.